Couture Historique: Carnegie Mellon Costume Production MFA: Graduation Class of 2013!!! Carnegie Mellon Costume Production MFA: Graduation Class of 2013!!! This draper's costume shop drawer - my patterning and sewing tools! This May I completed a Master's degree in Costume Production and graduated from Carnegie Mellon University! Woohoo! Having completed this rigorous three year program, I wanted to share a few thoughts and pictures from my experiences! In High School, I spent much time researching and recreating historical clothing. When considering my career path, I considered history, art and eventually landed on Costume Design, obtaining a BFA in Costume Design from Penn State University. Upon graduating, I knew that I wanted to continue my education with a Master's degree, but decided to take a few years off to determine my career path. In that time I started my own small sewing business making custom historical reproduction clothing for clients. After considering both textile conservation programs and costume production programs - because I was interested in both studying historical clothing and in reproducing it - I decided to pursue a degree that would further my sewing and pattern making skills and applied to and was accepted into Carnegie Mellon University's Costume Production graduate program. I remember visiting a sewing store the summer before entering the program, and standing in an isle filled with lovely sewing tools and hoping that I could one day sew truly well. Now, after having graduated from CMU, I feel that I am capable of sewing well - and of patterning even better. And, I now see, that even at that time I was capable of sewing well - it was just seeing that you don't need to know how to do every sewing trick to be good at sewing, you just have to stick to high standards, think through your process - and have a good reason for the decisions that you make when sewing, make lots of samples, do a mock-up fitting, first fabric fitting, and final fabric fitting, and take time to research and learn any techniques that you don't know - or create your new technique. You have to be confident in what you know. I also learned, through seeing it happen first-hand to our highly skilled shop manager, draper and tailor, that mistakes are common, especially when creating a complicated garment in a style that you have never before tried to conquer. Mistakes can be limited by having the appropriate number of fittings and creating samples of techniques prior to doing them on the garment. When mistakes happen, you don't have to feel defeated, you just have to pick yourself up and do your best to recover, learning from your mistakes. Evaluate what you want to improve in the future, but also appreciate all the things that you did well on the project. There are many things that I was taught in graduate school. But there were many more things that I wasn't taught. That's okay, because most importantly, I was taught how to think for myself. To trust my judgement, my instincts and my eye. Would I recommend attending graduate school for costume production? That's a tricky question. If you wish to one day become a draper or a costume shop manager, I would recommend working in the industry at the highest possible level for several years first to determine if the career is for you and to learn valuable skills that will help buoy you through graduate school. You can become a draper by working your way up in the industry, but having the skills learned in a degree - particularly the patterning skills which you will need as a draper - could launch you into that position sooner. If you're hoping to learn the skills to make better reproduction clothing, I would not necessarily recommend attending a costume production program. Yes, you heard me right. Many of the skills that you need for creating beautiful reproductions can be learned on your own. You won't be spoon fed most of the information that you learn in graduate school. You will work hard - excruciatingly hard, you will work incredibly long hours - 14-16 hour work days were common in my first year of graduate school, and you will fail a lot. That's how you will learn. And, quite honestly, if you are really dedicated to learning sewing and patterning skills, you can do that on your own. I was often told "look in a book" - I wasn't given the answers, I had to discover them for myself. There are books available that will teach you draping, flat-patterning and sewing skills so that you can pattern and sew like a pro. It was all worth it when we celebrated by attending CMU's NYC Showcase to display our work for industry professionals. My fellow classmate, Elisabeth (above with her display) and I, received lots of encouraging feedback from NYC costume designers, shop managers and drapers. Here I am with my display at CMU's NYC Showcase 2013. The 1950's dress was draped and created by me for a production of Bus Stop, and the 1770's dress was draped and created by me for a production of The Rivals. I also displayed some of my jewelry creations, millinery, corsetry, and beadwork, as well as fabric painting and dyeing samples. Although graduate school was hard, it was also very rewarding. I met and became friends with many talented designers and makers. Because I was in the first year of CMU's Costume Production program, there was only one other student in my year, and one in the following year. 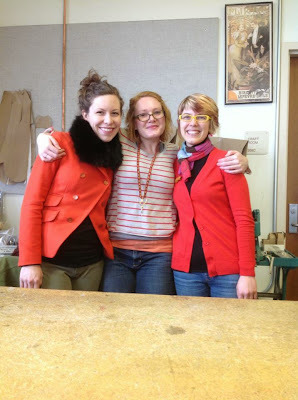 Only three students in the Costume Production program in my time at CMU. But lots of undergrad and grad designers. So, I became very close with these talented ladies. Above, I pose with Elisabeth Roskos (center) and Sophie Hood (right). Elisabeth came to CMU via a Fiber Arts degree with three years spent working under drapers in regional costume shops. Sophie majored in Japanese Studies and pursued art in her time after graduate school, doing art installations and creating large creature costumes. Each of us came with such unique skills and experiences that it was helpful to learn from and be inspired by one another and see how we each approached a project differently. There were some fabulous projects that we were assigned. One of these was a dye sample challenge. We were given a section of a portrait and asked to dye fabrics to match the squares on our section - above you can see that some students hold their assigned section in their hands. It's a challenge to dye fabrics to match a particular color perfectly, but the project was made even harder when we were asked to dye a certain number of squares from each type of fabric to be represented and place them so that no like fabric touched - wool, cotton, silk, etc. This particular assignment kept us up working very late shifts in the costume shop dye room, but when it was completed and turned in, the blocks all put together formed the portrait of a familiar CMU face. Fabric Dyeing and Painting were just two of the amazing crafts classes that were offered - and required for costume production majors - in my time at CMU. We also took Fabric Modification, Couture Techniques, Millinery I and II, Mask Making, Jewelry, Casting and Mold Making. Each of these classes was crammed full of information and techniques and lots of challenging projects. We also had several Draping and Flat Patterning classes with talented instructors. But most of the learning came through doing. Graduate students are required to spend 8 hours per week working in the shop, and for costume production students that means patterning and sewing costumes. A Production Assignment is also assigned each semester. Costume production students are assigned a costume to create for a specific show. Working from the designs of a fellow student costume designer, the production student acts as a draper or tailor to pattern and oversee the construction of the costume, creating a mock-up, holding fittings, and making samples to create a costume that is well-fit, beautifully constructed inside and out, and is made according to the designer's wishes. Often this means working with the designer to offer them options to choose from or samples to help them create the appropriate design to fit the needs of the show. This means being prepared to think on your toes and change direction at a moments notice. It is a challenging but fun and rewarding process. On top of all the fabulous class offerings by CMU instructors, visiting guest artists also offer the chance to learn a new skill in a weekend workshop. 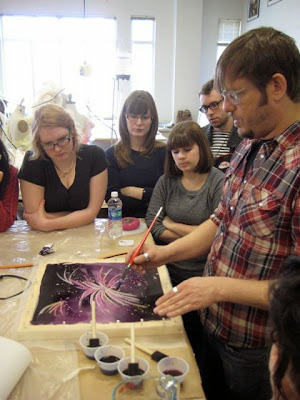 Above, Jeff Fender, silk painter extraordinaire, demonstrates a silk painting technique. Brian Russman, Associate Teaching Professor of Costume Production, was our advisor and the teacher of the majority of our classes. His hard work and dedication to get the program up and running and work through any hiccups along the way was extraordinary. I doubt that there are many teachers out there who give such well-prepared and truly fabulous lectures. Each lecture was filled with tons of samples and demonstrations, complete with bloopers and lots of laughs. He never ceased to challenge us to produce our best work. I'm thankful for the high standards that he instilled in us. Congratulations to Brian Russman and Carnegie Mellon University for graduating their first class of Costume Production students! Congratulations! I have been reading your blog for several years and remember when you began this. It has been such a delight to see your posts about current projects and techniques you were learning as you went through the program. You have a truly incredible gift and inspire me so much. Congratulations! What are your plans now that you have graduated? I'm sure you and your family are so proud of you, and I know your future will be very bright! Congratulations! And this was actually very interesting and relevant to where I'm at in my costume endeavors. After my father passed away I never finished my degree in Costume Design and sometimes wish I had gone back. But I was doing very well on my own and couldn't justify the expense. I'm very comfortable teaching myself things (crochet, knitting, pattern drafting and soon bobbin-lace), but I've sometimes wondered what I might be missing. I'm more interested in historical reproductions than working in theater anyhow (I sewed for Houston Grand Opera for several seasons before going it alone). Now I have a workshop over our garage with everything a girl could possibly want and even though I sometimes miss having a degree, it was really nice hearing this. Really enjoy reading your blog! What were some of your favorite books/resources? Hi Mina! I'm so glad that my post was helpful! :) I will look through my bookshelves and write a post about some of my favorite reference books that I've found while in graduate school - look for it in the next few days!